Health & BeautyTrec Gaba 750 - 60 kaps. Improvement of regeneration, improved enough sleep, deep and healthy sleep - this and more thanks to suplementowi! High quality and efficiency guaranteed by the manufacturer! 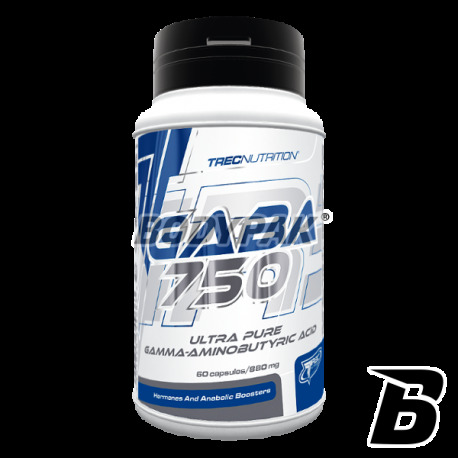 TREC GABA 750 supplements the diet with pure gamma-aminobutyric acid (GABA), which supports the proper functioning of the nervous system. This neurotransmitter limits its excessive stimulation, which can mitigate the effects of stress. GABA has a positive effect on mood, improves night-time regeneration and increases the production of growth hormone in the pituitary gland. GABA 750 helps reduce the negative effects of increased physical and mental activity in people leading busy lifestyles, in particular athletes. Intense exercise and stressful lifestyles often lead to a state of general mental and physical exhaustion. Each of us has ever experienced a situation in which, after going to bed he was too tired to fall asleep. How to deal with it? How to help the night regeneration and mitigate the effects of intensive physical and mental activity? Introducing GABA TREC 750 - a preparation containing 750 mg of pharmaceutical grade gamma-aminobutyric acid in each capsule. The product helps to alleviate the effects of stress, regulates excessive excitability of the nervous system and helps to achieve a deep and restful sleep. TREC GABA 750 also supports the production and secretion of one of the most important anabolic hormones in the human body - somatotropin or growth hormone. GABA (gamma-aminobutyric acid) is an organic chemical compound, which due to its construction belongs to a group of amino acids. This component serves as one of the main neurotransmitter of the central nervous system, whose operation is referred to as inhibitory. GABA is produced naturally in the cerebral cortex and cerebellum by specialized secretory cells. GABA acts through membrane receptors, GABA receptors (GABA), which is scattered in almost every tissue of the body. There are three main types of receptors: GABA A, GABA B and GABA C comprise first ion channels that upon binding to the molecule of gamma-aminobutyric acid are opened and the cells penetrate, chloride ions (CL-) thus increasing the potential difference (hyperpolarization membrane). As a result, it optimizes the transmission pulses and inhibit overactive nervous system. GABA B receptors are located and in the synapses (nerve endings). They are associated with the routes through the so-called ion. G-protein connection to their GABA improves the transmission of signals between neurons (nerve cells) and slowed down the release of neurotransmitters. The least known are GABA-C, which also contain an ion channel - the highest amounts can be found in the retina. GABA acts as a neurotransmitter, both in the central nervous system (CNS) and in the area of ​​peripheral nerve system (CNS). The above-described receptor capable of binding the acid are found in all neuronal cells. GABA is a neurotransmitter with inhibitory activity - what does it mean? Once bound to the appropriate for themselves receptor gamma-aminobutyric acid regulates the secretion of neurotransmitters and the transmission of nerve impulses. GABA is limited so excessive stimulation of the nervous system and soothes the neurons. This is particularly important in people with an active lifestyle, which often have contact with excessive stimuli, so their nervous system is overloaded. In a situation of excessive stimulation appears irritability and anxiety. Prolonged stress has a negative impact also on the capacity of regeneration of the body and often manifests itself in the form of problems sleeping. GABA binding to a relevant receptors in the nervous system gently soothes and relaxes, helps to stand the tension muscular and nervous and optimizing the brain waves. Gamma-aminobutyric acid can be an effective means of modulating the quality of sleep, thereby aggravating the night regeneration. GABA is not only helps you fall asleep, but also improves the quality of night rest. This component accelerates the transition process of the body in the most desired phase of slow-wave sleep. That's when the body calms down, reduces heart rate, lowers blood pressure and relaxes the skeletal muscles. GABA can both accelerate the achievement of deep, restful sleep and increase its length. Thanks to this morning we wake up rested and refreshed, and your body has a unique chance for a full recovery. According to the researchers in the case of GABA supplementation, you can rest better in a shorter time, even when you sleep less than optimal 7h. Gamma-aminobutyric acid has another very important function for athletes. Its supplementation favorably affects the function of the secretory. GABA enhances the production and ejection of one of the most powerful anabolic hormones - somatotropin. Growth hormone (GH) is secreted in the largest quantities in the two periods: during the phase of deep sleep (Norem) and during extreme physical exertion. Sam growth hormone is produced by the anterior pituitary gland. GABA in combination with resistance training increases the secretion of growth hormone. Thanks to our effort brings better results, and adaptation of muscle faster. Scientists have conducted various studies to confirm the positive effect of GABA on secretory processes of the pituitary gland. This neurotransmitter active in combination with heavy exercise of force and an adequate amount of sleep is able to intensify the effects of regenerative processes and the growth of muscle tissue. In a scientific study conducted by researchers at the University of Connecticut analyzed the effect of GABA supplementation in 11 men trainees bodybuilding - the average age was 23 years. They performed squats with a barbell, since extreme exercises cause the greatest reproach somatotropin. Weight was 70% maximum potential strength of study participants, and the training lasted 90 minutes. Compared to the control group supplementing with 3 grams of GABA daily levels of somatotropin in the blood has been significant increase. It is also found that in subjects builders also increased testosterone and IGF-1 (insulin-like growth factor). Using the gamma-aminobutyric acid under certain conditions (strength training), these hormones can lead to the phenomenon of muscle hypertrophy. GABA as a neurotransmitter of the central nervous system improves the quality of sleep, and it was at night is emitted the largest amount of growth hormone. This component reduces the effects of stress factors and can achieve much deeper and more efficient sleep. As a result, the quantity of secreted growth hormone and anabolic effects on the body are even greater. In addition, GABA has the added effect of anabolic and anti-catabolic, because it reduces the secretion of cortisol - a stress hormone that destructive effect on muscle tissue. GABA inhibit the adrenocorticotropic hormone (ACTH), secreted by the pituitary gland, which in turn stimulates the adrenal cortex to the production and secretion of cortisol. TREC GABA 750 is a dietary supplement recommended especially for people leading busy lives, both physically and mentally. The product helps to optimize the nervous system in people who want to alleviate the effects of stress associated with demanding workouts or professional work. Use of the product makes it easier to fall asleep and have a positive impact on the quality of the night regeneration of the body. GABA 750 also allows the possibility to maximize the anabolic organism in the production and secretion of growth hormone. 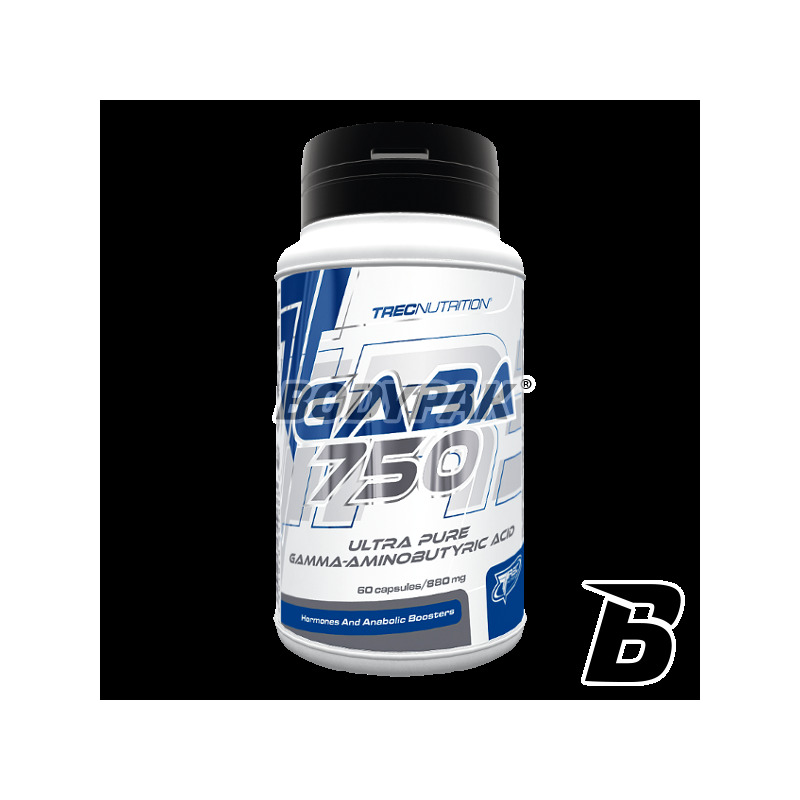 TREC GABA 750 HELP YOU falling asleep, IMPROVE REGENERATION, contributes to a better BEING BUT ALSO accelerate the increments of MUSCLE! Sen o wiele lepszy oraz pobudka również bardzo dobra! Człowiek wstaje mega wypoczęty ! Sen o wiele lepszy, śpi się po tym bardzo przyjemnie, regeneracja na plus! Działa jak należy. Miałem dość spore problemy z zasypianiem, a teraz już nie muszę się tym martwić. Wystarczy jedna tabletka i zasypiam w mgnieniu oka. Polecam wszystkim mającym problemy ze snem.